The small county has become a hotbed of activity for criminal elements. A picture of one of the growhouses in Longford. THERE HAVE BEEN 15 cannabis raids in Longford in just over a year as gardaí attempt to disrupt the activities of a number of international gangs using the sparsely populated county to distribute the drug. An Irish criminal – who is well-known to gardaí for his brutality - is also involved in the cultivation of the drug in the county, as part of a separate illegal enterprise. Two of the raids related to the Irish criminal, who is originally from west Dublin. The other raids were on premises believed to have been controlled by gangs from Lithuania and Poland, TheJournal.ie understands. Many of the Eastern European gangs have been operating in Ireland for years and have recently moved westwards to find rural areas to grow the plant. Garda drug units based in the west continue to use the best resources available to them. However, many of these growhouses are located in extremely rural areas where garda cover is minimal. Two national roads – the N4 through Longford town and the N6 to the south – provide quick access to the capital and to other parts of the country for the criminals involved in the trade. To effectively police the area, local officers have been asking for the garda helicopter to be deployed over the Longford region as the air support unit has infrared technology which is capable of picking up heat signals. Cannabis cultivation requires a large amount of heat lamps and electricity to work properly. Any large scale growhouse will be easily seen from above due to the heat generated. Local officers have asked garda management for repeated overheard patrols of areas where it is suspected that cultivation of the drug is taking place. The Irish criminal has slowly been getting family members and friends to move out to the Longford area. Gardaí believe that these people are involved in the cultivation and distribution of cannabis back into Dublin. He himself has believed to have fled Ireland due to the threat to his life from other criminals. Gardaí in Longford, under Superintendent James Delaney, have been successfully cracking down on the dealing in the county, which has a population of just 40,000. In separate crackdowns in June of this year, eight people were brought before the courts after gardaí seized cannabis, cocaine, heroin and three cars in the county. That followed a widespread search operation involving more than 50 gardai, including the Armed Support Unit. Seven men and two female suspects, aged between 18 and 55, were arrested. “The operation has caused significant disruption to those who are engaged in this type of activity. It is strong evidence of the continued commitment of An Garda Síochána to enhancing the quality of life in our communities by removing and disrupting this kind of activity from our streets and towns. Earlier this year, gardaí charged two men after seizing a large quantity of cannabis plants following a search of a residence near Abbeylara, Co Longford. Gardaí from Granard, assisted by the Roscommon/Longford Drug Unit and the Regional Armed Support Unit, carried out a planned search of a house and adjoining garage. 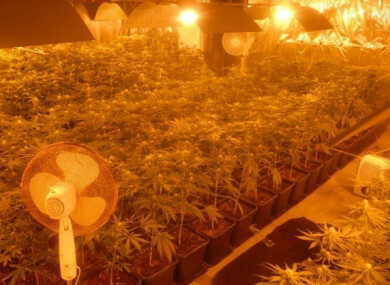 During the course of the search, a cannabis grow house was discovered in the converted garage which contained cannabis plants with an estimated street value of up to €360,000. Comments are off as legal proceedings are ongoing in some of the referred cases. Email “European gangs are using rural Longford to grow cannabis on an industrial scale”. Feedback on “European gangs are using rural Longford to grow cannabis on an industrial scale”.